Summons, Judgments, Garnishments...What You Need to Know! If you have received a summons for an unpaid, unsecured credit debt, you know how intimidating it is! In order to help you understand why this has happened and what your options are now, I'm going to walk you through the basic process and give you ideas on how to prevent in the future. Dealing with the stress of having too much debt and not able to make the minimum payments due is a terrible experience. Then, you get a knock at the door and are handed a SUMMONS! Are they going to garnish your paycheck or levy your bank account? Most likely, the answer is NO! Let me walk you through the basic litigation process and I think you'll understand more and hopefully feel better! When you applied for the credit card or unsecured loan, you were making a promise to repay the debt per the payment and interest of that account. Retired on a very limited fixed income! When you don't make the minimum payments required by your credit account agreement, you'll start getting letters and calls. The letters will warn you that you missed a payment and now you must make up the missed one, pay the late fee and add the next payment due!!!! The calls usually come after a couple of months of missed payments. Unfortunately, the original creditor has the contractual right to call you. Once these accounts are charged off and/or sold to a collection agency, you can put a stop to the calls. I've been helping people deal with credit issues for over 15 years and have not found it very helpful or productive to try to explain yourself to the agent making the call. "I've had some things happen and can't make the payments now. I intend to get caught up soon, but would appreciate it if you would stop calling." This may work, but don't be surprised if it doesn't. After 2-3 months of non-payment, your credit card or unsecured account will most likely be transferred to a DEBT COLLECTION AGENCY. If the calls had stopped, they will begin again. The calls will stop, but the letters will continue. You may get a letter with a SETTLEMENT OFFER. The current balance is $$$$$$$, but we are making a one-time settlement offer of $$$$$. This must be received in our office by (date). Sometimes, these are not bad offers! I've seen some at 40% or so of the balance (yes with all of the added interest and late fees), but for example, a $4,000 settlement on a balance of $10,000 is a pretty good deal! However, I'm guessing that if you had that kind of money, you wouldn't have gotten behind in the first place! Debt Collection Agencies (sometime attorneys who specialize in debt collection) have either purchased the debt or have taken it on a kind of consignment. The debt collector will get a percentage of what they collect. So, they are going to play "HARD-BALL" and try to get as much as possible out of the debtor (you). How much the collector paid or stand to earn on this particular debt. Different creditors (Capital One, CitiBank, etc.) each have their own parameters of what they will or will not take as a settlement. Your particular financial circumstances also play a very important part of the negotiating process! If you are employed and are paying a mortgage, the collector may not be willing to come down much as they may decide to file a claim hoping to get a judgment in the future. I'll explain more about this later. But, if you are unemployed, disabled, retired, renting and just barely getting by, they will be more willing to accept a good settlement (40%-50%). Before you make the call, it is a good idea to have "all your ducks in a row" so to speak! You need to have completed a budget (what's coming in and going out each month). The collector will need to provide this in order to present you offer to the original creditor or their manager. Now that you know where you stand financially, you can make the call. Most debt collectors are surprisingly professional and even polite, so you do the same! Being aggressive or having a "take it or leave" attitude will not help! But on the other hand, don't beg or show weakness either. Just explain your situation and that you are trying your best to work out settlements rather than being forced to seek BANKRUPTCY PROTECTION. 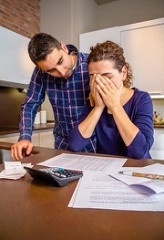 Although bankruptcy is an option, you should do everything you can to avoid it as it stays on your credit report a long time and makes it difficult when applying or credit in the future. OK... Let's say you negotiate a good settlement....Now what? Before you set up or make any payments, you MUST....ABSOLUTELY MUST have the agreement emailed, faxed or mailed IN WRITING! Once you have the written agreement, you can either call to set up automatic payments or mail them per the agreement. If you are mailing the settlement, make sure it arrives on or before the due date! They can and will void the agreement if you are late! If you cannot reach a settlement agreement, the collector may opt to go for a judgment. How Does Consumer Debt Collection Work? Have you ever been contacted by a Debt Collector and wondered why they are calling you and how in the world they got your number? In this post, I will attempt to explain the Consumer Debt Collection process and what to expect when they start contacting you. The consumer debt buying industry began in the early 1990's when the US government started selling off assets from savings and loan banks that had failed. As consumer debt has grown exponentially over the past decade, the number of debt collection firms has skyrocketed as well, growing from about a dozen firms in 1996 to several hundred today. The big credit card companies are not able to devote the enormous amount of time and money into pursuing the thousands of people who fall into debt each year, and debt collection companies are eagerly stepping in to buy the debt from creditors for a fraction of the total debt. The Federal Trade Commission (FTC), which monitors the complaints lodged by consumers against debt collectors, regularly receives more consumer complaints about debt collectors than any other industry. However, the number of complaints has quadrupled in the past five years. How Consumer Debt Collection Works! The typical debt collection company will purchase your debt from the original creditor who is essentially trying to cut its losses. The debt collector will then attempt to recoup any, if not all, of the original debt. The worst part is not that the debt collectors are trying to collect on an old debt, but instead, it is the Fraudulent Debt Collection practices they use. Some particularly nasty debt collection companies are resorting to illegal practices -- verbal abuse, harassment, and even threats of violence and lawsuits -- in an attempt to squeeze money from consumers for the debts the company has purchased. In fact, many times the debt collection company isn't even bothering to harass and abuse the right consumer. For example, the Washington Post reported that a New Hampshire man was repeatedly called by a debt collector about a loan his daughter owed even though the daughter had moved out 15 years earlier. The debt collector reportedly called this man six times in 15 minutes! On the last call, the debt collector told the man his Social Security number, his wife's name, and threatened to send thugs. Another particularly troubling recent practice is the growing number of cases where debt collectors persuade consumers to pay just a little of the amount due, and then they use the bank info to improperly withdraw more money from the consumer's bank account. The FTC enforces the Fair Debt Collection Practices Act, which outlines consumer rights and prohibits debt collectors from engaging in unfair, deceptive, and abusive practices. The key to protecting yourself, and your sanity, is to KNOW YOUR RIGHTS!